Almost a year after resigning as Bolivia’s Defense Minister, Cecilia Chacón has broken her silence to question President Evo Morales’ recent appointment of ex-Interior Minister Sacha Llorenti as ambassador to the UN—an act which, she says, signifies impunity for those responsible for the police repression of lowland indigenous marchers last September 25 at Chaparina. In July, federal prosecutors excluded Llorenti from the official investigation of the case. Despite outcries from human rights and indigenous organizations, he assumed his new UN post on September 5. 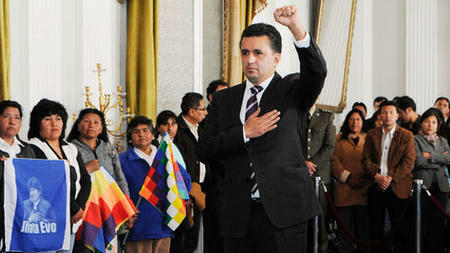 Appointed by Morales in April 2011 as Bolivia’s first-ever female Minister of Defense, Chacón resigned less than 6 months later in response to the Chaparina attack. "I do not agree with the decision to intervene in the march and I cannot defend or justify the measure when other alternatives existed," she wrote in her resignation letter. Since then, Chacón—a self-described “militant” in Bolivia’s “process of change”—has maintained a low profile, avoiding media contact and public criticism of the Morales government, despite her disagreements with it (and in contrast to other dissidents). Many believe she would have continued to keep her silence, were it not for the provocative appointment of Llorenti. In a September 3rd statement posted on her Facebook page under the title “In Defense of Hope,” Chacón argues that Llorenti’s designation “not only signifies impunity for those responsible [for Chaparina], but is a tacit affirmation that what happened… is considered valid and justifiable.” It undermines the impartial investigation that Morales promised, she notes, as well as the opportunity for a much-needed process of governmental reflection and self-criticism about how the conflict was handled. “We’re not yet witnessing a sincere desire by the government to correct the damage,” says Chacón. She raises the important questions about Chaparina that have not yet been answered. “Who prepared the plan [for intervention]? Who proposed it? Who authorized it? Who executed it? Who applauded that it was implemented ‘cleanly and without casualties’?” A year later, the official investigation designed to address these issues has barely advanced. Sacha Llorenti takes UN oath. Credit: Angel Llanes, La Razón. 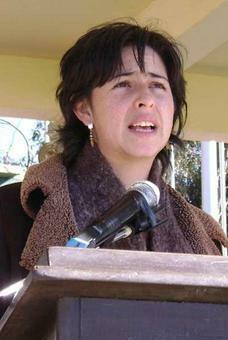 More broadly, Chacón views the appointment of Llorenti as evidence of the Morales government’s failure to “rescue” a now misguided “process of change.” The process, she argues, is not the monopoly of any political party or enlightened elite, but belongs to the Bolivian people, who now have the right and the duty to defend it themselves. Still, she insists, “I am not against the Executive. I want every day to make things right." The reaction to Chacón’s statement has been largely supportive, judging from the comments (and 245 ‘likes’) on her Facebook page. A few critics have charged her with playing into the hands of the political opposition (knowingly or otherwise). In fact, opposition leaders are now demanding that she testify before public prosecutors to officially disclose what she knows about Chaparina—including who ordered the mobilization of military airplanes to disperse the marchers back to their communities (an action thwarted by local sympathizers who prevented the planes from landing). The Morales government has not officially responded to Chacón’s statement. For those interested in the current saga of Bolivian politics, it’s definitely worth a read (to date, in Spanish only).